We received a lot of great feedback and questions from our previous blog about computer server rooms. That is why we decided to do a more in depth article about heat removal methods for IT environments. Data centers and IT rooms are becoming an integral part of businesses across the globe. And, as technology continues to change and evolve, computing equipment is being created in smaller sizes. However, the smaller size uses more electricity and can generate more heat, which creates a need for better heat removal methods. So, it is essential that such spaces have precision cooling and heat rejection equipment in order for the equipment to stay at an even temperature and avoid overheating. There are several heat removal methods in which cooling equipment can be used to mediate the high heat generated by the computing equipment. Below are five examples that are used most frequently today in order to promote a proper functioning data center or IT room. One option that is often used in an IT environment is a two-piece air cooled system. For small to medium sized rooms, this type seems to work the best. Known as a split system or DX system, the unit uses two parts. One area of the system is known as the computer room air conditioner. It uses the refrigeration cycle while the rest of the system is outdoors with the air cooling condenser. The refrigerant is circulated between the indoor and outdoor unit via refrigerant lines. The heat produced in the computer room is then pumped to the outdoors via the circulation of the refrigerant. Another option is the self-contained system. All the refrigeration cycle components are in one unit that is placed in the IT environment. Heat is removed from the room into the system as hot air. Then, the air is routed outdoors or into another space so that the computer equipment can stay cool. Another option is the Glycol cooling unit. This system also uses a refrigeration cycle in one system but will use a heat exchanger instead of a condensing coil. Glycol will flow through the heat exchanger and collect heat along the way from the refrigerant and then transport the heat away from the IT room. Glycol is a mix of water and ethylene glycol, a mixture that is similar to antifreeze used in vehicles. This option is close to the glycol cooling system in the way the refrigeration cycle takes place. The components are located in one unit but water is used instead of glycol to collect and move heat away from the IT space. The heat is placed in the outside area with a cooling tower instead of using a fluid cooler. 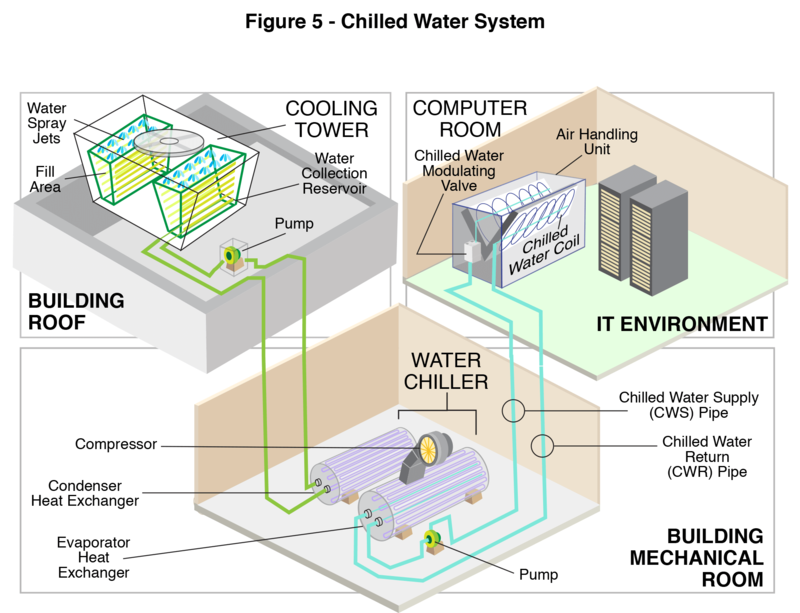 For the final option for IT rooms, a chilled water system can keep an IT area cool. I can also keep computer components from overheating. A water chiller is used to produce chilled water that will then be pumped in pipes from the chiller to the air handler of the computer room in the IT space. The air handler will then cool the air by removing the heat from the computer room via chilled water coils that are filled with the cold water. The heat will then flow out by exiting the computer room air handlers and then return to the chiller. Overall, these are a few options that work to keep an IT space temperature controlled. Such cooling systems are needed to ensure that space remains in proper working order, without systems overheating or shutting down. There are also data center layouts to consider as well. If you have any questions about this or other HVAC concern, contact us today.